Dugway geodes cut in half to show quartz-lined cavities. Largest geode is approximately six inches in diameter. Approximately 6 to 8 million years ago (Miocene epoch), volcanic activity occurred in western Utah and deposited an extrusive igneous rock called rhyolite. Trapped gasses formed cavities within the rhyolite, and millions of years of ground-water circulation allowed minerals to precipitate into the cavities. The result is geodes with spherical shapes and crystal-lined cavities. Roughly 32,000 to 14,000 thousand years ago, a large body of water known as Lake Bonneville covered most of western Utah. The lake’s wave activity eroded the geode-bearing rhyolite and redeposited the geodes several miles away in the Dugway geode bed area as lake sediments. 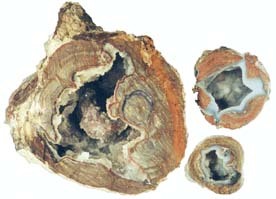 Most geodes are typically hollow whereas others are completely filled with massive, banded quartz. The most common mineral found within the geodes is quartz in various colors: clear (rock crystal), purple (amethyst), and pink (rose). From Salt Lake City take I-80 westbound until you reach the Tooele turnoff (exit 99). Travel south on Highway 36 for about 40.5 miles to the Pony Express Road (which is the dirt road just past Faust). 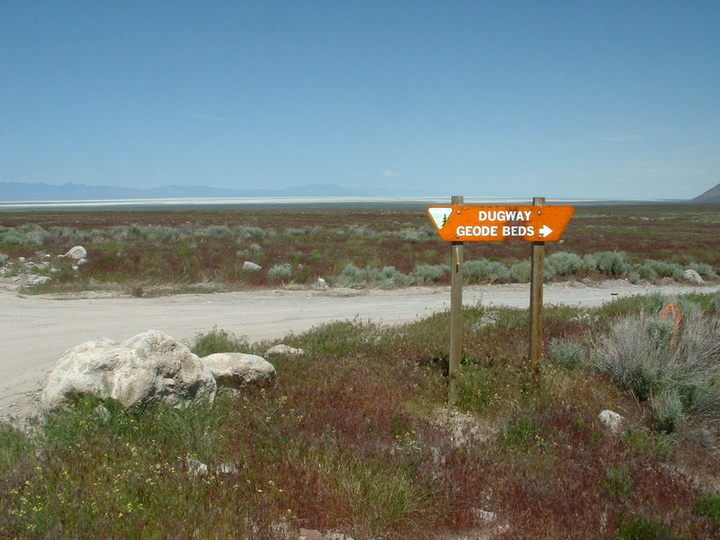 Turn west (right) and proceed 50.1 miles on the Pony Express Road to the Dugway geode bed turnoff. Turn north (right), proceed up the dirt road and look for recent diggings. Recently, people have bypassed the turnoff because the sign to the geode bed area was missing. Please note at the time of this writing, there is a temporary sign indicating the correct direction to the geode bed area; however, please use your vehicle’s odometer to determine distance to the geode bed turnoff. Geodes can be found approximately 1 to 2 miles north/northeast of the turnoff. The easiest technique is to find an area of past excavations and start digging to locate the proper horizon where the geodes can be found. You will be digging in a soft, unconsolidated material that is susceptible to caving, so please be careful! Examine all stones that are encountered. The geodes are fairly easy to recognize due to their spherical shape and light weight. Most geodes are 2 to 3 inches in diameter and are typically lined with small quartz crystals that give the cavity a sugary appearance. I collected fragments and whole geodes near UTM map coordinates 12S 0317569 4416919. Fish Springs 1:100,000- scale topographic map, Dugway Pass 1:24,000-scale topographic map, and a Utah highway map. These maps may be obtained from the Natural Resources Map & Bookstore, 1594 W. North Temple, Salt Lake City, UT 84116, (801) 537-3320 (or 1-888- UTAH-MAP). Bureau of Land Management (BLM) public lands. Active mining claims exist on some portions of the “geode area” so seek permission from the claim owners before collecting. For more information on BLM public lands under claim contact the House Range/Warm Springs BLM field office at (435) 743-3100. Tools recommended: a shovel, pick, safety glasses and hammer (in case you want to break your geodes on the spot). Whole geodes can be taken to your local rock shop to be cut in half. Bring plenty of water and remember to bring a spare tire in case of an unforeseen accident. More importantly, be patient and have fun collecting! This is the last Rockhounder column to appear in Survey Notes. The column will be replaced by another describing geologic points of interest in Utah. For continued rockhounder information, contact the Natural Resources Map & Bookstore for a selection of rock and mineral collecting guides.